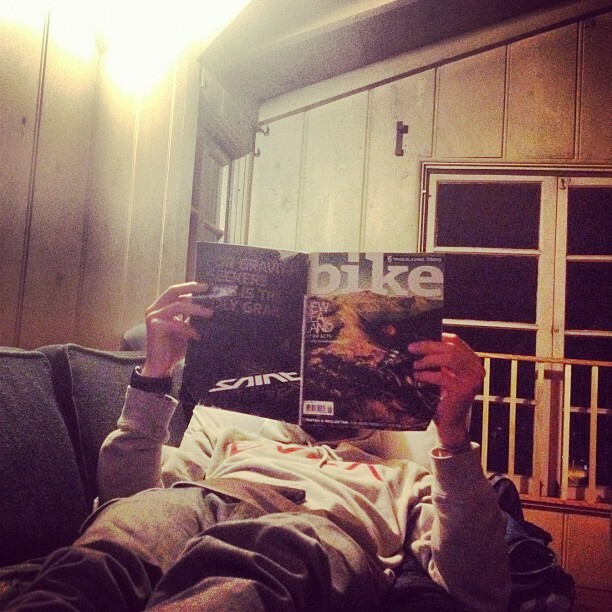 The above image of @amarcoux reading the one existing copy of the June issue of Bike Magazine was tweeted by @morga_deth. On the cover you might be able to read the words ‘NEW ZEALAND’ and if you had Adrian’s view you might be able to read that the chap on the cover is me. The photo was taken in April 2011 by Jordan Manley as part of a Bike Mag piece which Rob Story penned. I miss New Zealand, especially as this is the first time in five years I have not spent at least part of the Northern Hemisphere winter there. I can smell the memories, hence why I wrote this little piece about my first 24 hours in Auckland last year, and why I have popped it up here. Until not too many years ago I was a “casual smoker”, and by casual I mean I would casually smoke my way through each day like a narrow gauge train in a North Yorkshire coal mine. Since giving up smoking, the main thing I have regained is my sense of smell. Which is rather peculiar; that by given something up I have gained something. Usually I relate giving something up to losing something. Like when I gave up caring about changing underpants one summer and I lost my girlfriend. Anyway, where was I? Was I about to launch into an evangelical rant about how evil smoking is? Nah, that doesn’t sound right. Oh yes, there it is a few sentences back, the frayed end of this yarn. I was talking about smell and how wonderful it is to be reunited with it after years of sticking incense sticks made of burnt dog hair up my nose. Nowadays, whenever I land at an airport it is the smell that strikes me. As I exit from airport arrival terminals it is like having a nose bag of local odors strapped to my snorter. Each airport arrivals has its own smell. Jamaica smells like sweet smoked potpourri. Whilst landing at the great airplane pile up known as Heathrow the smell is like wet sports clothes that have been left in a kit bag in the garden for the weekend. Vancouver, depending on the season, either smells like you have thrust your head into the deep freezer at the grocery store or like you have pressed several Pine Fresh Glade Plug-Ins up your nose. Lisbon airport smells like cured ham that has been rolled in an ashtray. LAX smells like glittering promises that are choked by the reality of waking up each morning to find that in the great employment lottery you find yourself wiping up burrito vomit from plastic tables rather than snorting cocaine off the thighs of Hollywood’s latest starlet. You get the picture. Each place has a smell and even a faint whiff teleports you to that place. When I landed in Auckland a few weeks ago, the smell I was greeted by made me feel like I had just dove from a mossy rock into a refreshing pool of water. Hair wet, cool shadows, warm rock. Shampoo advert kind of thing. There could be a beautiful girl draped across a rock with a flower in her ear. It was a beautiful feeling to bathe in that smell. Due to a day long lay over in Auckland before heading again to be in the Southern Alps I had to check into a motel. The only available motel near enough to be commutable for the dawn connection was in the middle of an industrial area. I had nearly 24 hours to kill in that place, and unwilling to take an elaborate choreography of taxis and buses to get into downtown I decided to just chill out in the motel and treat that day like a busman’s holiday in order to get over the long haul flight acid bath brain. However, I don’t deal well with these kinds of holidays. I hate sitting around doing f-all and I get antsy just lounging. So after about 45 minutes I had expended all the entertainment available in this drab dirty motel. The pool was out of order (it looked like a hippopotamus had recently taken a bath in it) and I had only packed a hip flask of Appleton’s, which was gulped with relish in order to provide entertainment in my own intoxication when the motel’s amusement potential failed to hit even Shopping Channel levels of interest. All I was left with was to nose the bouquet that even industrial Auckland provided. You see, even the dirtiest, most down trodden, commercial district of Auckland smells better than the handbag of a pop songstress. It was a pleasure to be back in this incredible country and even though Auckland is regarded as the ash tray of the land of the Long White Cloud it is truly a lovely little city. Over the next few installments of World Affairs I will be gushing about Nu Zelund like a 50 year old divorcee who just had a two minute conversation with the check out girl at the grocery store, decides to learn what the Facebook is all about and buys the new Fall Out Boy album just to impress the check out girl. Weird eh? Trust me, if you don’t already love NZ then I think you will once I have fawned over it endlessly. That or you will get a restraining order. Join me on a not so literal literary trail ride through the thyme fields of Alexandra which I hope will give you the courage to take a trip to the rugged open space of Central Otago to take a ride there yourself. Think about breathing in the humid tropical sweetness of the bush around the Marlborough Sounds. Consider sniffing up a line of Wellington inner city singletrack. Put a metaphorical peg on your honker for the quality riding around the stinking bog of Rotorua. Have a whiff of imaginery burning brake pads and splintering pine on the hills that loam over Queenstown. But first, to move from this motel room, wash the stench of previous occupants from my nose, and follow the nose of my bike through the perfumed ribbons of singletrack of New Zealand. Until next time. August 7, 2012 in Uncategorized, words, World Affairs. Awesome read, loved the descriptive airport smells bit & yeah, thanks for making me even more homesick to get back to NZ! Loved your read, especially the descriptive airport smells bit & thanks for making me even more homesick to get back to NZ!